What's up this time at the Vista caravan park? I hear the Police have been hovering around. Anyone know? Next meeting Tuesday 17th April 2007 at Swanage Sailing Club 8pm. If you have any concerns about Swanage Bay or would like to join the Association and help maintain safety and harmony with in the Bay. 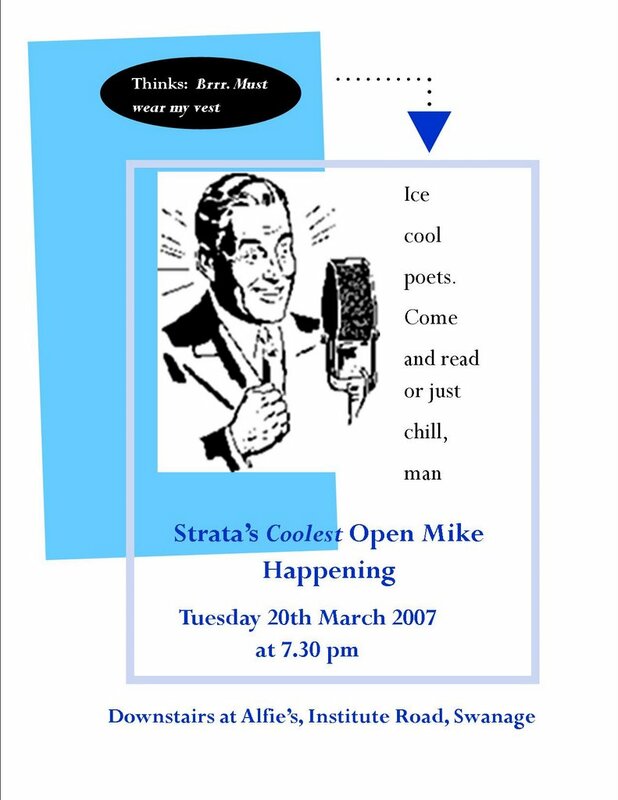 Please come along and join us... the bar is open! Many discussions on this Weblog end up discussing the rights of LOCALS. As someone who can trace and document his familiy back through 500 years, locally, why don't I start a thread on what is a local? I'm enough of a reactionary to stick to The Isle of Purbeck. Wareham is not in Purbeck. A local is someone who has lived for some time in or around Swanage. Swanage Sea Rowing Club is having an Open Day at the Stone Quay, from 12pm on Sunday 1st April, for anyone to come along and have a go. Just turn up if you're interested. Or come along and watch. Ready to vote on 3rd May? If you are not already registered to vote, but want to, you should complete the appropriate form by 18 April if you want to vote in the elections on 3 May. Application forms can be downloaded from http://www.purbeck.gov.uk/ or sent through the post by calling (01929) 557219. There's a Council meeting at the Town Hall on Monday 26th March, with public participation time at 7.15 pm. Mike - would you mind changing the link on your links on the left? I'm going to delete the blog site soon so theres no confusion. Dorset County Council Highways Dept is looking at improving two drop kerbs in Swanage: by Alfie's Restaurant, Institute Road, and by the Angling Centre, High Street. "We need an income but financial gain is not the most important thing in the world. We need to try to help the environment and help poor people out of poverty in the third world." Nope - The Swanage and Purbeck Holiday Accommodation Association. Following the success of the 7th Swanage Blues Festival (next one 7-9 March 2008), I am considering the possibility of a Blues & Roots Weekend in Swanage sometime in September, October or November. The timing is crucial, so let me have your thoughts please. If you haven't been before, make it a date. I've noticed that the glass is regularly broken in the bus shelter by James Day Home in Ulwell Road. It's such a shame and such a waste. Also there are disabled and elderly people in wheelchairs and buggies who have to leave the pavement and go out into the road to avoid the broken glass. I feel sorry for them because it's very dangerous there to go out into the road. I wonder why anybody would want to break the glass in the bus shelter? Perhaps they will read this and stop doing it now, knowing that they are making life difficult for the elderly and disabled people who have to go into the road with the traffic. Do you want to start a thread about transport policy? A lot of people interested in that might not read a thread on housing. Sending Poole- Weymouth/Dorchester traffic along the northern route sounds very sensible apart from the congestion on the road into Weymouth from Dorchester until the relief road is built. At the moment they need to go down through Crossways/Warmwell to avoid this. The distance is very much the same as going via Wareham and I though this was the route most people used now that most of the road west of Wareham has a speed limit. I would think its quicker although its not a journey I ever need to make so I can be certain. Have you seen a traffic survey on journeys through Sandford? It would be interesting reading. I suspect a lot of it is from the estates that line the road having unwisely been permitted without the needed transport infrastructure being provided. When the train line is eventually connected to Swanage a park and ride at Holton Heath would remove a proportion of tourist traffic from tha A351 as would a marketing campaign to persuade visitors from Poole and Bournemouth to come by train. Somehing like a third of our visitors start their journey in the conurbation so this could have a big impact if properly handled. WEDS APRIL 19th, 7PM, The Red Lion meeting room, High St, Swanage. Numerous readers of The Gazette have requested that a meeting be set up for all those affected in whichever way by the articles in The Gazette over the past three months regarding the current housing crisis - locals, second home owners, businesses, etc. Everyone welcome. 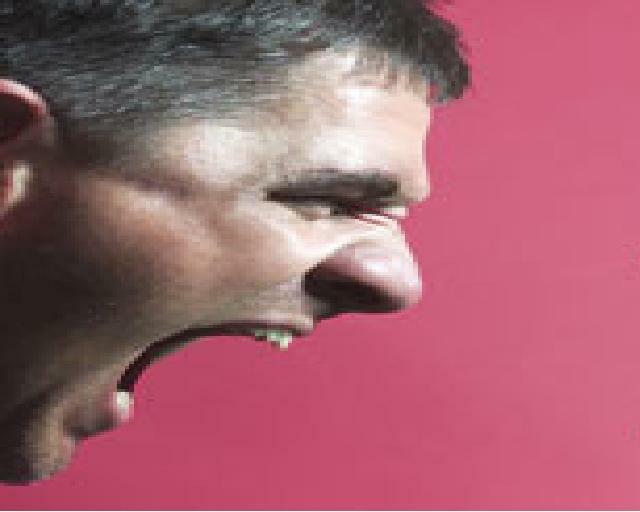 Come and give your opinion - action, not reaction is required. Please make the effort to attend if you have an opinion to express. A Square book, text by Ilay Cooper, illustration Jack Daniels, design James Twist will be launched at the Square and Compass on 17th March 1pm to celebrate a century of the Newmans at the helm. All are welcome. why are these figures about fat cat county council bosses hidden away on yr website? Dont you think its interesting enough to know why our council tax is going through the roof. 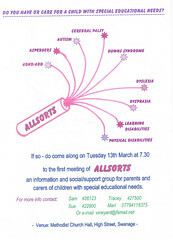 All relatives or carers of children with special needs are welcome to join the first meeting of new self-support group "Allsorts" on Tuesday 13th March 2007 at 7.30 pm at the Methodist Hall, High Street, Swanage. Purpose of meeting is to establish what type of group is needed to meet the needs of the community. "A Blues Covent Garden" the Advertiser said. Out of season on what would otherwise have been a quiet weekend in March. The Swanage Blues Festival is BIG, with people coming from all over the UK and abroad, and the BBC, national newspapers and magazines recognising its importance with substantial coverage. What I saw was a seaside town out of season, full of people who had flocked there to revel in a joyous festival atmosphere. Meanwhile the shops, pubs and restaurants, like the hotels and guest houses, were taking a great deal of extra money. I know how much my wife and I spent, and we did not begrudge one penny. It was marvellous! But did you know that for a year beforehand, Steve Darrington puts a huge amount of effort, time and his own benefit money into creating this annual success for Swanage? Sadly he overdid it this time and collapsed Saturday lunchtime, spending the rest of the weekend in bed, so he didn't even get to enjoy it himself. Can you honestly say that he got your support? Did you put up a poster, make a donation or take out an advertisement on the website (for £12 a year, that's all he asks). He can't do it without you, you know. You can still help. Steve's already launched himself into arrangements for next year, and he's got plans for other weekends. But he can only do it if you, the people of Swanage, offer your help, support or financial backing. You can contact him via the website www.swanage-blues.org or phone him on 01929 422338. Don't he shy, he can't afford to be and still make it happen again. Many people were disappointed that the sales facility was recently withdrawn at the Panorama Road recycling centre. I have taken this up with Dorset County Council who have persuaded their contractor to agree the reinstatement of this service on a trial basis from Friday 6th April. So, use it or lose it. After all, re-using items that others don't want is one of the first principles of recycling. Thank you DCC and W&S! I hear the hospital is going to be closed at night- presumably the person who told me this was referring to the minor a&e department. Anyone know about this? I must just say that I was delighted to see that our Sun reading - not got the reading age necessary for the Torygraph - Council have finally decided to help our young people. They are redecorating the Chav Hut. How nice - I wonder if they consulted with our future tax payers over the colour scheme? One last point, will the fence be taken down? Shore Road is now going to be closed over the summer. Ocean Bay to the Mowlem. I know there are going to be mixed views on the implications of this, but it IS happening. Now with this in mind and the fact we are having tuk-tuks, change is in the air my friends. I'm proposing that on saturdays in the summer, we have several street performing pitches in this space and allow entertainers to work in these areas. I'm writing to the council to suggest this. What do people think. PLEASE lets not debate the pro's and cons of this here, it is happening wether we like it or not, I just want some feedback about having covent garden style entertainers here.